Here’s a crazy fast and delicious recipe for a Friday. 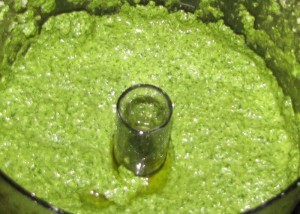 Basil Pesto. Honestly, it takes 10 minutes to make and apparently keeps for an eternity. This was the 3rd sauce I made on Sauce Day last week. 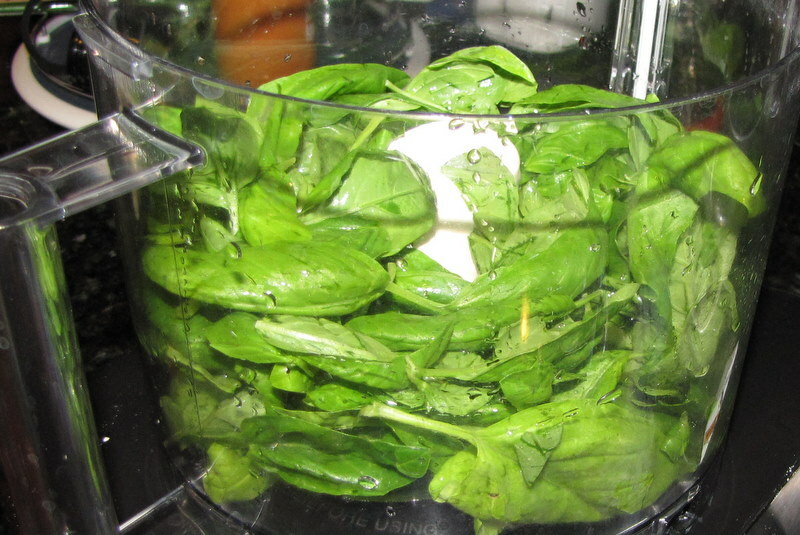 Unfortunately I don’t have any photos of this pesto on anything yet, so I’m limited to an unappealing photo of it still in the mixer bowl. I didn’t really think the photos for this one through. But I can tell you it is delicious. 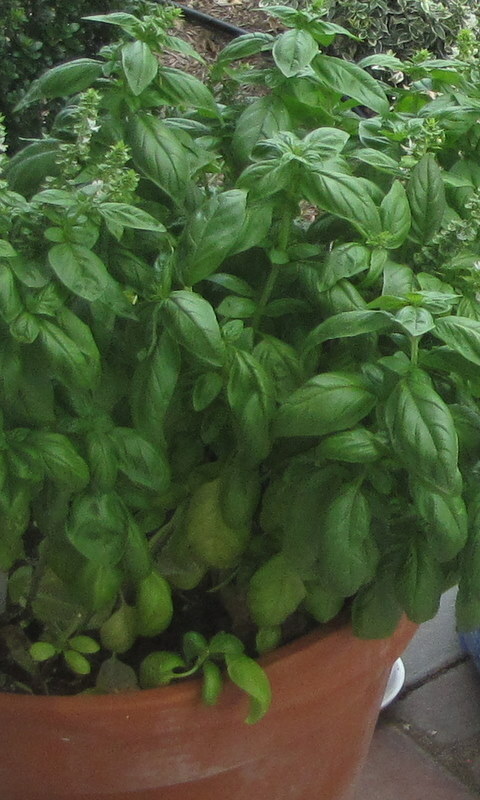 But instead of my usual “finished recipe” photo to start, here’s a picture of the abundance of basil I’ve got growing on my back steps. The stuff is growing like weeds, and it is delicious and incredible having it fresh whenever I want to cook with it. But it was starting to take over this flower pot, so I decided to cut down half of it and make a big patch of pesto. 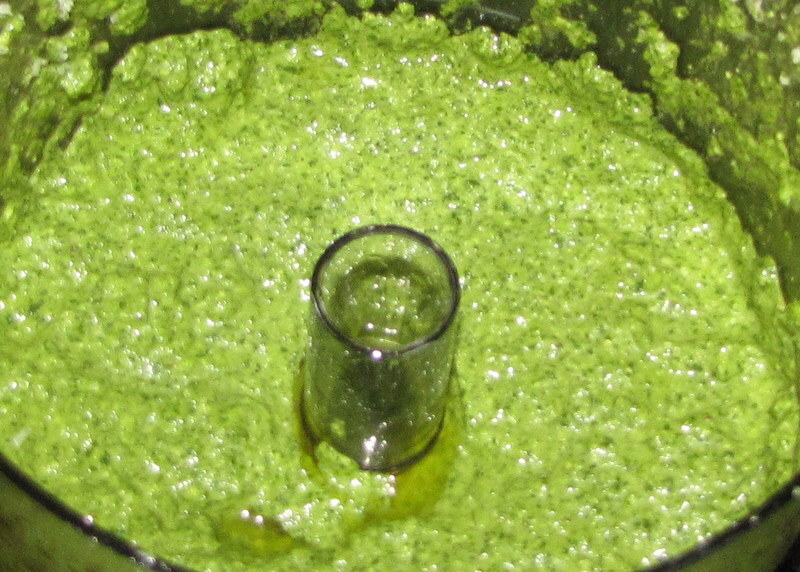 I should admit here that although I had Mario Batali’s recipe, I first decided to just “wing it” and make up a pesto recipe for a new How To page. I kind of realized this wasn’t going to work as I planned, so I went back to Batali’s recipe and tried to adjust it best I could with the ingredients I had (I didn’t use any pecorino romano, just parmesan). So I’m posting the original Batali recipe here, but my results are a little more of a bright green affair than his are in the magazine. 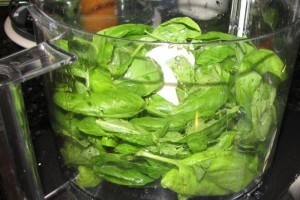 And I doubled the amounts in this recipe because I had so much basil. But here is the original. 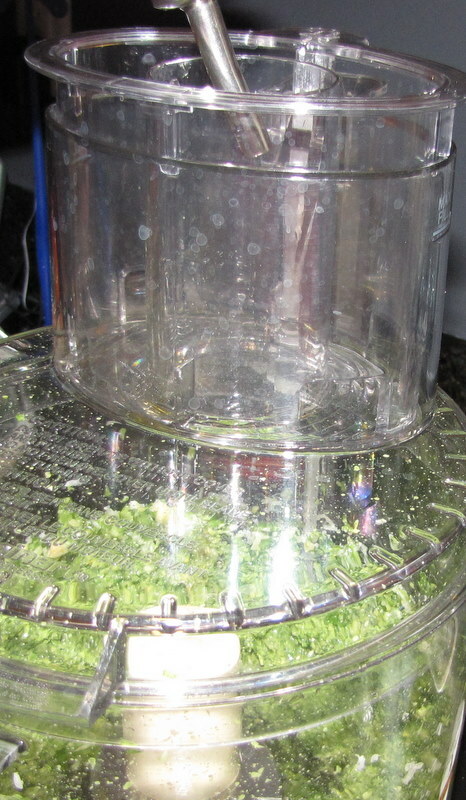 With the motor of your food processor running, drop the garlic in to chop it. 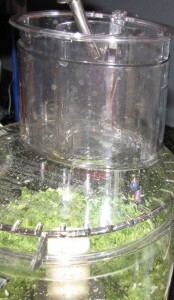 Add the basil, pine nuts, and salt and pulse it until everything is coarsely chopped. Then process it until it’s finely chopped. Drizzle in the oil while the motor is running. Transfer to a small bowl and stir in the cheeses. **I added the cheese in the food processor, which is probably why mine turned a much brighter, lighter green.